Right now, it seems like a barely a week passes without another story illustrating just how dangerous and downright stupid synthetic cannabis really is. It may be known by hundreds of different names, but in each and every instance what you are looking at is exactly the same thing – potential death in a bag. The fact that synthetic cannabis has attracted such intensive media exposure makes it impossible to believe that anyone right now doesn’t know exactly how dodgy it is. Nevertheless, given the fact that it is cheap and readily available, it continues to be snapped up in huge quantities. One of the biggest problems with synthetic cannabis in general is the way in which it continues to give real cannabis a bad name. Cannabis critics and those who don’t bother to find things out for themselves simply assume that the two are to a large extent one and the same and therefore should be treated with an equally heavy hand. Of course, anyone with a modicum of intelligence and/or common sense knows that this isn’t the case at all, but synthetic cannabis continues to give real bud the kind of bad name it really doesn’t deserve. So with this in mind, what follows is a brief overview of 10 things we currently do and do not know about synthetic cannabis – all of which should be considered carefully by anyone stupid enough to try the stuff. First of all, the most important thing we know about synthetic cannabis is that it really should not be called synthetic cannabis at all. The fact that it contains the word ‘cannabis’ in its title unsurprisingly gives a lot of people the impression that it has at least something in common with marijuana. In fact, many believe it is actually something of a marijuana derivative. In reality however, the two have absolutely nothing in common. Cannabis is a naturally occurring plant that has been extensively tested and verified as both safe for human consumption and medically beneficial in a number of ways. By contrast, synthetic cannabis is nothing more than a bunch of random dried-out twigs, leaves and herbs, which before being packaged are sprayed with all manner of terrifying chemicals. Which in turn means that it is a 100% man-made synthetic product and has absolutely nothing in common with real cannabis. You can ask as many experts as you like, but the simple fact of the matter is that absolutely nobody has any real idea what is in any given bag of synthetic cannabis. 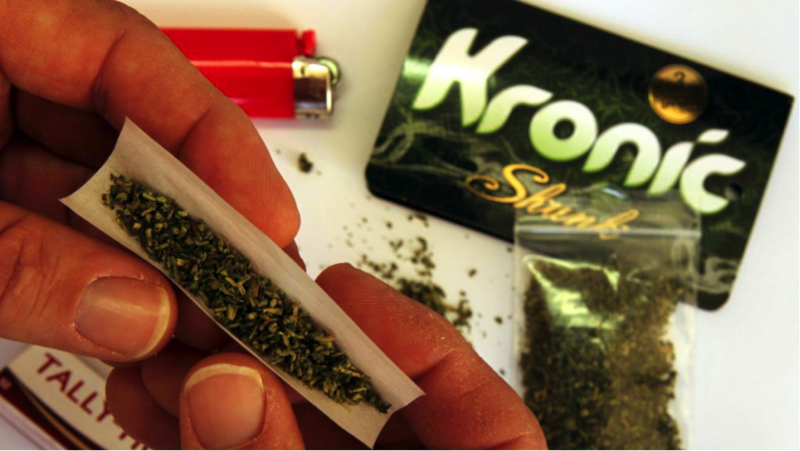 At one time, it was possible to pick up synthetic cannabis in hundreds of thousands of stores spanning multiple countries. At this time, the formula was relatively similar from one batch to the next. These days, it is commonplace for manufacturers to continually alter and change the formula as a means by which to evade laws, as and when each given product is rendered illegal. Not only this, but it has been found that when taking several bags of exactly the same substance, it can be pretty much guaranteed that each one has an entirely different chemical composition. Which means that even if you smoke a batch of synthetic cannabis and don’t end up seriously messed up, there’s every chance you will next time you use the same product. The number of people trying synthetic cannabis and experiencing terrifying reactions is accelerating like never before. When comparing the first few months of 2014 to the same period in 2015, the number of calls received by United States poison centres directly related to consumption of synthetic marijuana increased by approximately 230%. During one three-week period alone, more than 1,000 calls were registered and 400 people were admitted to emergency rooms. Once again, this all comes down to the way in which the chemical formula used to create the stuff is constantly changing and you genuinely have no idea whatsoever what you are getting yourself into. As such, the best advice is to not get yourself into it in the first place. One of the most important supporting arguments behind cannabis legalization is the way in which it has never been directly associated with a single fatality in recorded history. Long story short – cannabis does not kill. By contrast, during the first five months of 2015 alone, synthetic cannabis was directly linked with a minimum of 15 fatalities. Not only are chemical formulation changes triggering more adverse reactions than ever before, but given the fact that doctors also have no idea what their patients have ingested, it can be incredibly difficult or even impossible to know how to treat them. Even in the case of the most dangerous and deadly drugs on the planet, it can at least be said that those responsible for treating people with adverse reactions have some kind of protocol to follow. The debate as to whether cannabis psychosis actually exists or not remains heated and on-going to say the least. However, there is absolutely no debate whatsoever as to the potential for synthetic marijuana to trigger an array of absolutely terrifying mental health problems in those using it. From psychotic episodes to powerful hallucinations to outright catatonia, it can be a case of being immediately overpowered by something you have absolutely no control over. While under the influence of synthetic cannabis, users are known to have killed domestic pets and attempted to eat them, murder members of their own family and turn up at local police stations stark naked. The reason synthetic cannabis is so cheap is because it is spectacularly easy to make. At one time, as already mentioned, it had a relatively specific and constant formula that was used in every batch created. Making the stuff is a simple three-step process which doesn’t take any kinds of ingredients or products that cannot be picked up cheaply, easily and entirely legally. These days, the fact that manufacturers are quite literally making it up as they go along is making it easier than ever before to produce synthetic marijuana. They have no idea what they are doing, they really don’t give a damn what goes in there and so they don’t follow any specific method or rules. As long as they can put it out quickly and cheaply, they know that there will be plenty of people foolish enough to buy it. It was actually a chap by the name of John W. Huffman, PhD, who first invented the initial batch of synthetic cannabis, purely for the purposes of research. Interestingly however, he himself has spoken out against the use and availability of synthetic cannabis, lobbying for it to be made illegal. By contrast, he firmly believes that real cannabis should have been legalized a long time ago. “We declared marijuana illegal in 1937. The federal government passed the law. Now, that really did a lot of good to keep people from smoking marijuana, didn’t it?” he said. “You can’t overdose on marijuana, but you might on these compounds.” So there’s really no denying the fact that when the actual creator of something tells you that you shouldn’t be doing something, it’s probably a good idea to listen to them. Contrary to popular belief, it is in fact perfectly possible to detect synthetic cannabis by way of drug testing. Which means that if you think you can get away with using the stuff when you have an important drug test coming up, there’s a pretty strong chance you won’t. The reason being that those responsible for drug testing standards have had plenty of time to adapt their approach, in order to ensure that the kinds of chemical compounds that are used to create synthetic cannabis are also scanned for during a variety of drug tests. That being said, the fact that the chemical composition of synthetic marijuana is changing all the time means that there will always be shifts in its composition that make it at least temporarily impossible for it to show up on conventional drug tests. For those on the testing end of the spectrum, it was still costing somewhere in the region of $60.00 per test at the end of last year – assuming you wanted to carry out a test that would definitely detect synthetic cannabis. As such, there are definitely still problems with the testing system for these kinds of synthetic products, which can be problematic for those who need to carry out such tests. Last but not least, there is only one reason and one reason alone why characters like Scooby Doo are used to advertise synthetic cannabis. Think of it this way – do you ever think a day will come when marketers will get away with using the face of Spongebob Squarepants on a beer can or Dora the Explorer on a cigarette packet? The answer is of course, absolutely not – never in a million years. Nevertheless, these guys get away with it due to a distinct lack of regulation, despite the fact that it is plainly obvious they are marketing their products to children…and idiots.